Today, Addie appears to be feeling better. Her activity level has increased such as moving about more and grooming herself. I have been offering her several varieties and brands of cat food. She finally began nibbling on Nestle Purina NF which is a food that I am feeding (2) of my cats whose kidneys are slowly playing out. She likes canned Fancy Feast and dry Hill’s Science Diet so I fed that to her initially until she became finicky about her food. It is a real test of my endurance and determination to get her back to where she was before this “thing from hell” ‘reared its ugly head. As I write this post she is reclining on part of my computer and I have to move her head to tap the backspace key. I don’t mind at all when my cats are lying on the computer- I just move them out of the way for I know they like being near me. The computer gives off some warmth and I think, slight to moderate warmth is soothing to cats. Just about all of my cats will lie on the computer if given the chance. Each day I check Addie’s suture line and today I noted there are 2 small spots that are red and oozing slightly. I have applied BNT ointment that my veterinarian prescribed just for this possibility. So far, Addie has not attempted to lick these areas. If all goes well I think her sutures can be removed by next Monday or possibly this Friday. FYI: The ointment consists of: B= Baytrill (an antibiotic), N= Nystatin (an anti fungal), and T= Triamcinolone (a steroid). This ointment really works for all kinds of wounds, hot spots, ear infections, etc. Simply put, it is good stuff! It is shipped to me via UPS after my veterinarian calls in the script. A compounding pharmacy in Goldswaite,Texas formulates the ointment. It might be interesting to know that a pharmacist must have additional schooling in order to be a “compounder.” Compounding means to take a medication consisting of a powder or it could be a liquid and then turning it into a different form for application. I think the pharmacy also probably must have a special license for compounding. I just know that this method has been a life saver for people and their animals. I want to add one more example. A pet owner who can not give their pet medication by mouth can now rub certain medications on the inside of the ear (not in the ear canal) of their furry pal and get virtually the same benefit. Addie, yesterday July 4th, seemed perkier. Her appetite had increased some. I had been leaving cat food out in several places- Hill’s Science Diet Original and Nestle Purina EN, hoping that she would like this mix. I more or less had to follow her from room to room to see if she had decided to eat a few bites. So I was happy when she actually began nibbling on some dry food. I had offered her canned AD and EN but she was not interested. It seems as if healing from the drastic surgery takes more time than I had expected. It was major surgery in the sense that she had 4 breasts removed plus the lymph glands on the left side. I was giving her Bupenex 0.1mg subcu but I think the med dimmed her appetite and it certainly caused her to sleep almost all of the time. But, maybe not. Animals, at least cats, I think, know how to cope with their pain. I gave her Bupenex for pain when I noticed that she was breathing faster and she was purring. I’ve read that cats cope with pain and illness by purring and I really got to see this in Addie. I gave her pain medication only when she exhibited the behavior that I mentioned. I began giving her Ringer’s Lactate 100 ml subcu for dehydration last Friday. Giving her the fluids was a real test of patience. Overall I could see a difference in how she was feeling. The next day after the first round of fluids she began to nibble a few bites. The Ringer’s was given for 3 days and I feel it made a difference. At any rate she did not require pain meds yesterday nor today. Overall she is slowly getting back to the cat she was prior to surgery- just minus four teats and a lymph gland. At this point, there is no way of knowing if she is cancer free internally unless I choose to have a vet do an MRI or an ultrasound. I have no idea what these cost but I’m sure these tests do not come cheap nor what the average person would be willing to shell out or pay to keep their pet around for a few months or up to several years. So to sum all of this up cost wise, put away a dollar or two every day or more and don’t touch your pet fund. Leave it in the bank and continue to add to your fund until you need it for something major. You will be glad you did. I know, I am. Addie 7/1/2011 Trying to scratch after removal of E-collar. According to research, cats are more susceptible for a teat to become cancerous if they have kittens, several heats or are not spayed before the age of 6 months. 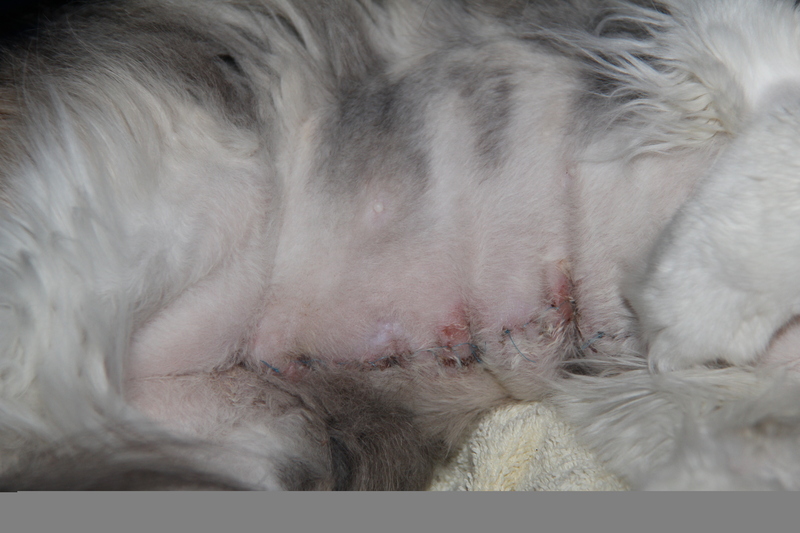 In general, mammary tumors occur at 9 years old and above and is seldom found in younger cats. The “books” reccomend getting your cat “fixed” before their first heat cycle. It seems that hormones going willy nilly play a part in this disease from hell. Among all cats, the Siamese, Persian, and the calico cat (which is not a breed but a color pattern) in that order, have a higher rate of developing cancer. Authorities in veterinary health suggest that your cat should be inspected monthly just as humans should perform regular self breast exams. For the exam, stand your cat up and palpate under the arms and in the groin area. Next palpate each breast- there are 4 teats on each side. Next roll your cat on each side and exam each breast and then lastly try to put your cat on its back and manually and visually inspect each teat (breast). Do not forget that there are 8 breasts to examine. At this time you can again examine each arm pit and then exam each groin area. Examining your cat is not that difficult unless you happen to own a cat with a nasty disposition. If you can not examine your cat and if you can afford monthly vet visits, then by all means take your cat to your vet and be present when the examination is done. Watching your veterinarian examine your cat will give you some direction on how it is done. If your cat is unwilling to allow the exam, then begin getting them to warm up to the idea that exams mean lots of petting and treats. Reward your cat with a tasty treat each time you handle your pet. Some cats just need to become familiar with being touched in the underbelly area. While most cats enjoy a belly rub, some cats do not. So this is where the treats come in handy. Well , by now you are saying rubbish to all of that. “My cat is most likely safe from getting a mammary tumor.” Well folks, it is more common that you think and it affects dogs also. 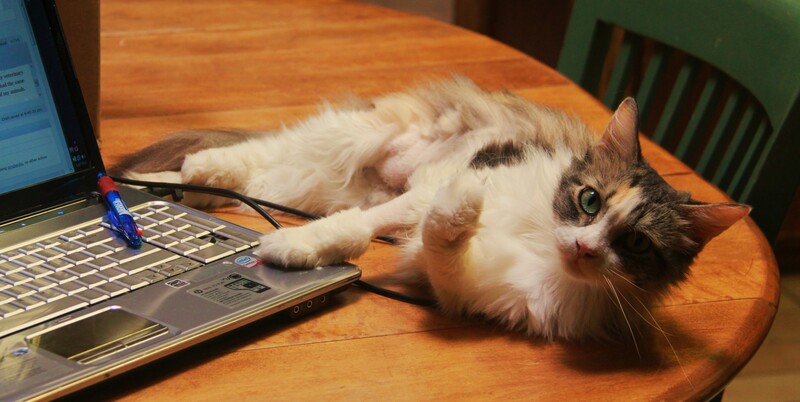 About one cat in 4,000 will develop a mammary tumor. The trick is to find that thing from hell when it is very small. Any tumor under 2cm appears to have an advantage of being eradicated by surgery if it is not present in the lymph nodes. Actually a tumor in its infancy of less than 2cm has a better outcome of giving your cat a longer life. BUT my veterinarian told me that even the “little” tumor might have already metastasized to a vital organ, generally spreading to the lungs first. Some information that I read gives a prognosis of up to 4 and 1/2 years after surgery BUT providing it has not spread to other internal tissue. If the tumor is greater than 2cm, the survival rate greatly diminishes. So all in all mammary tumors are the “pits.” A veterinary oncologist can give your cat a round of chemo but again results are mixed with the survival rate of 2-4 months or perhaps a year or two if your cat is lucky. 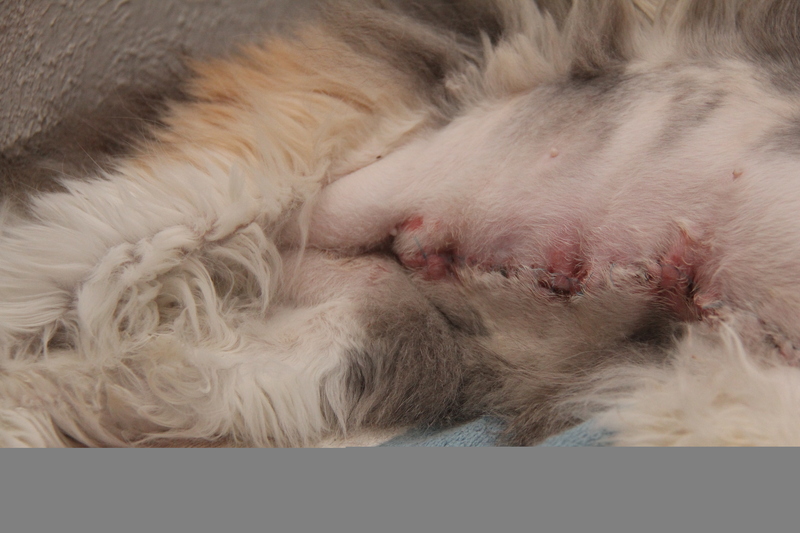 Several factors come into play such as cost, if the tumor has spread, and if your cat can physically handle chemo. Not all chemo drugs are suitable for cats. Yes, the drug might knock out the cancer but one drug is known to “fry” the kidneys meaning that renal failure will kill your cat before the cancer does (in most cases). Surgery here in Texas runs around $1,400 plus x rays, labs, and an echo cardiogram if your cat happens to have a heart murmur (my cat did but it was not severe enough to prevent surgery). Perhaps an ultrasound or MRI will be suggested if you have the $$$$ and if the surgeon wants to rule out the spread of cancer to other parts of the body. So when all of that is added up, you are looking at near $3,000 or more. Chemo therapy is really costly and will run thousands of dollars. Lab tests are done with each treatment which really sends the cost up. Addie’s surgeon did not suggest an ultrasound or MRI for he felt is just was not necessary. At this point I wish that I knew approximately how long my little cat will live but then again maybe it is best that I do not know. I just enjoy her each and ever day that she is alive. My worry now is that her appetite is poor and I hope it is related to the healing process. More updates are coming. Today, Addie, only ate a few bites of canned AD. I gave her 75ml of Ringer’s Lactate for hydration. I plan to give her B-complex sub cu in the morning in an effort to stimulate her appetite. First photo: Sutures of in-line mastectomy (all breasts of left side). Third breast down was malignant. Mass size was approximately 1cm. There was no “found” evidence of cancer cells in the lymph gland or the lymph node. Addie seemed to feel a bit better on post operative day 4. The surgery was by no means easy. It was the equivalent of a human mastectomy. There is considerable pain and I simply had to observe her body signs and behavior to determine when she needed medication. She rested on her side most of the time- asleep or not. I had dumped a load of towels on the bed and when I returned with more towels she was lying in the towels that were still warm from the dryer. She looked as snug as a bug in a rug and that is where she napped. For pain management, I gave Bupenex 0.1mg subcu between the shoulder blades once today. About 30 minutes after the injection her respirations had slowed down some and she was not purring in an effort to cope with her discomfort. Her appetite was also better but I had given her an injection of B-complex which helps to srtimultate the appetite. I fed her dry Purina EN. If a cat can not smell the food, s/he simply will not eat. Her total food intake for today was about 1/4 cup, maybe a tad more. In addition, she drank a large quantity of water this afternoon, which was a good thing! The very invasive dental surgeries were done in June of 2011. 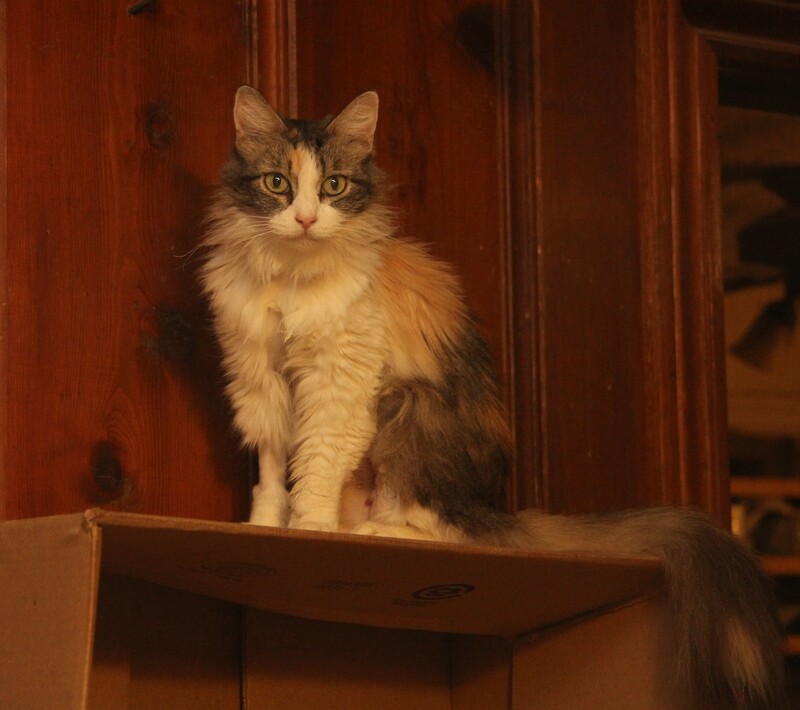 This is a pic of Maize who was once a feral cat. I trapped her, a sister, and a brother about 13-14 years ago. She loves to be petted and is in absolute ecstasy when I groom or pet her. 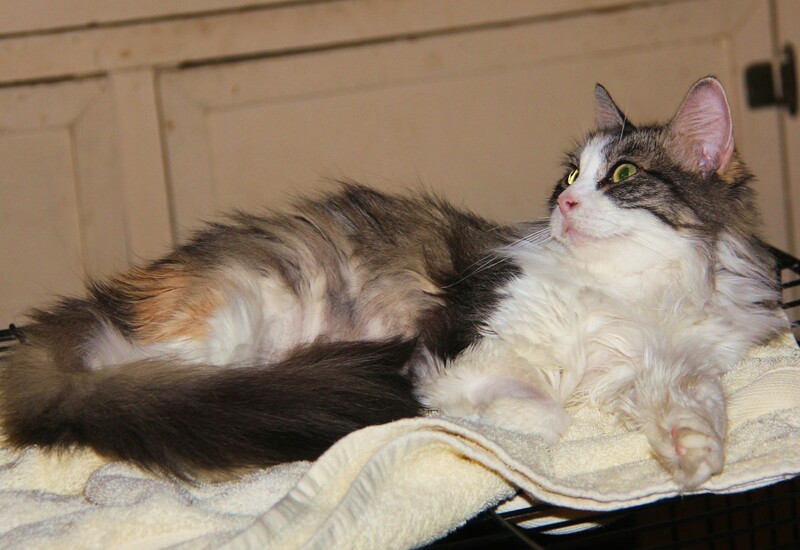 Her fur mats easily even though she is not a long haired cat so she was shaved prior to her dental surgery. Of all my cats she is probably the shyest one and has never been confrontational with the other cats over food or sleeping spots. 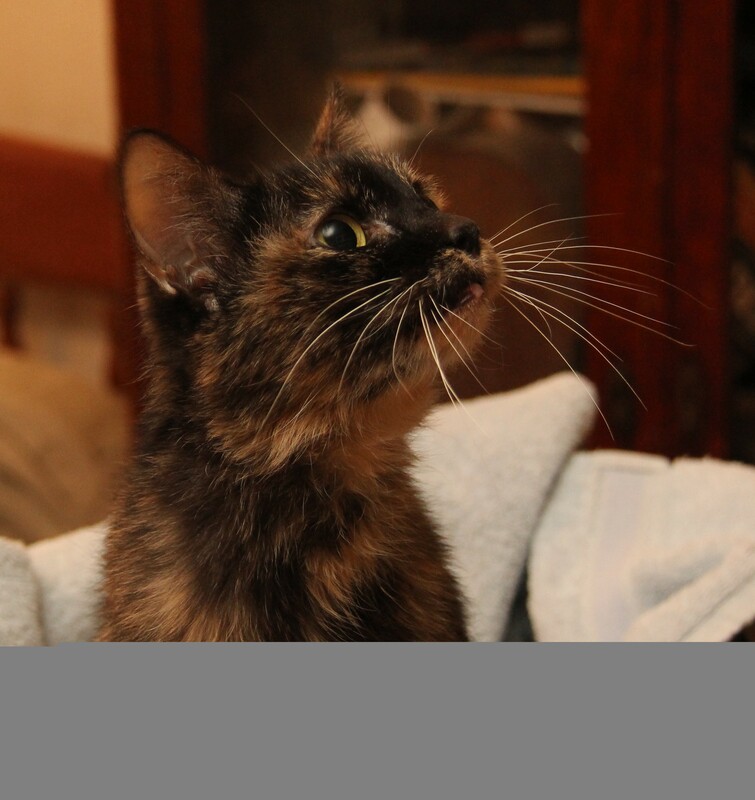 Maize, this sweet little tortoiseshell also had dental surgery the day after Sassy’a surgery. A very talented Austin, Texas board certified, veterinary dental surgeon, Dr. Steve Capron, performed the surgeries on my cats about 5 weeks ago. Maize’s had gingivitis of the gums and decayed teeth. She is doing well at this time but must be on a low protein diet, (NF) which is made by the Nestle Purina Company. It was necessary after the dental surgery, to feed her soft canned food with her favorites being AD made by Hill’s Science Diet. I also fed her Fancy Feast by Purina for the first 4 weeks. Her mouth was quite sore and she required pain meds in the form of Bupenex which I gave subcutaneous between the shoulder blades. After about 5-6 days she no longer required pain medication.The kidney diet was gradually introduced and it remains an on-going process to get her acclimated to a different food. She is not wild about the RX diet but it is must. Maize received two antibiotics- Clindamycin which is an antibiotic- (it can be given orally as a pill or liquid and also subcu or intramuscular) to kill bacteria that has been growing and that is also unleashed whenever there is/are extractions of the teeth. For a kidney infection, which I am sure resulted from the diseased teeth, she received Seniquin 1/2 tab, daily and good golly was that a chore. I used a “piller” that I purchased from Pets Mart( and one that actually held the 1/2 tab until I pushed the plunger as far back into her mouth as I could get. It was a real tug of war between the “pill” and the the pill that I was trying to give her. Generally it took me 2-3 tries until I had gotten really fast and adept at getting that pill at the back of her tongue so that she could not spit it back out. I had to give both antibiotics longer that I care to remember. I don’t remember exactly but both cats took the antibiotics for the same length of time. 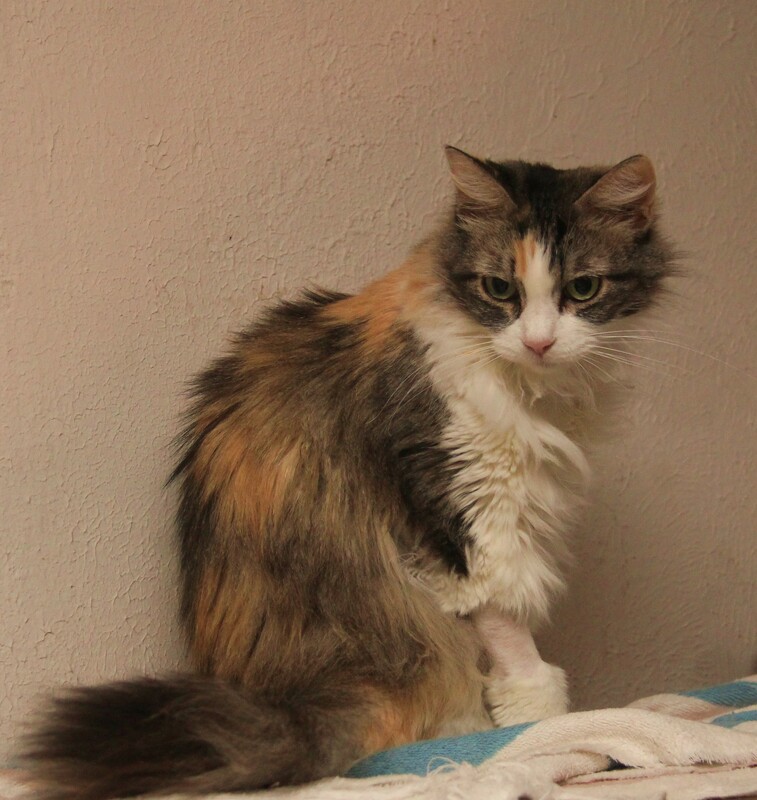 Each cats’s medications were calibrated on their weight with Sassy receiving the larger dosages since she weighed around 11 pounds and Maize weighed about 6 and 1/2 pounds. I gave and I am still giving Maize, Ringer’s Lactate which is a fluid that is given either intravenously or subcutaneously. I use the subcutaneous route because these cats are getting fluids daily. It just would not work to have a permanent needle inserted in a vein. It would be too painful and needles do come out of the vein. If this happens it is called infilltration and the fluid leaks out into the tissue. That becomes a real mess and presents a potential problem for an infection such as cellulitis. For cats whose kidneys are declining in health, it is good to lessen the strain on the kidneys by supplementing their oral fluid intake with subcu fluids. The cat is better hydrated in this manner and the fluids are not nearly as difficult to give as the oral medication. Preferably the fluids should be given daily but of late she been getting them three times weekly. As of June 2oth, 2011 Maize and Sassy appear to be doing well and I hope and pray that these procedures will give them several more good years of life. This is photo of my my cat Sassy, who came to our house as a youngster of about 8 months old. I returned Sassy to her owner three times and each time she came back the next day. Clearly she had decided that our place of abode was more appealing than living in an apartment where her owner continued to allow her to escape. Each time she came back to our house she jumped into my husband’s bass boat and the seat became her bed. She “talked” to me each time I discovered her in the boat which was parked in the “boat port” near the house. I finally gave up returning her and her owner did not call to learn if her cat had taken up residence at our house again. In April, I discovered Sassy’s teeth were in a terrible condition. I felt guilty since some of my pets for the past year and one half, due to family matters, did not get the attention that they had been getting before my life changed for the worse for a while. By the time I realised she was ill from the condition of her teeth and gums, she needed BIG TIME, REAL, DENTAL INTERVENTION. A veterinary dental surgeon in Austin,Texas, pulled all her teeth and the sockets were filled with a special substance.